Clint Eastwood, Jeff Bridges, George Kennedy, Geoffrey Lewis, Gary Busey, Bill McKinney. 115 minutes. 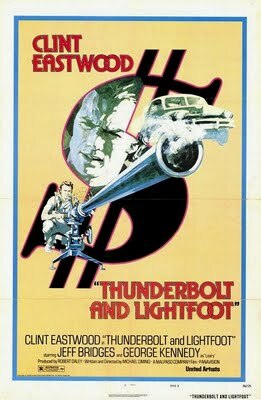 THUNDERBOLT AND LIGHTFOOT is one of the most interesting films Clint Eastwood made in the 1970's, during a period when he was at the peak of his stardom (he was the decade's top box-office draw). It wasn't one of his biggest hits, and although it is in many ways a typical Clint vehicle, in other ways it really broke new ground for him and anticipated the critical respect his career has enjoyed since his Oscar-winning UNFORGIVEN (1992). The film is a 'buddy' picture, a road movie and a heist thriller, a welding of three genres particularly popular during that era. Eastwood stars as 'The Thunderbolt', a bankrobber whose specialty is blowing open safes with a 20mm cannon. When we first meet him, it's clear that this picture is going to at least be a little different: Clint is wearing the dogcollar of a clergyman and addressing his clergy! The first shots of the movie, the beautiful scenery of Montana, inform us that this isn't going to be an urban thriller like COOGAN'S BLUFF (1968) or DIRTY HARRY (1971). 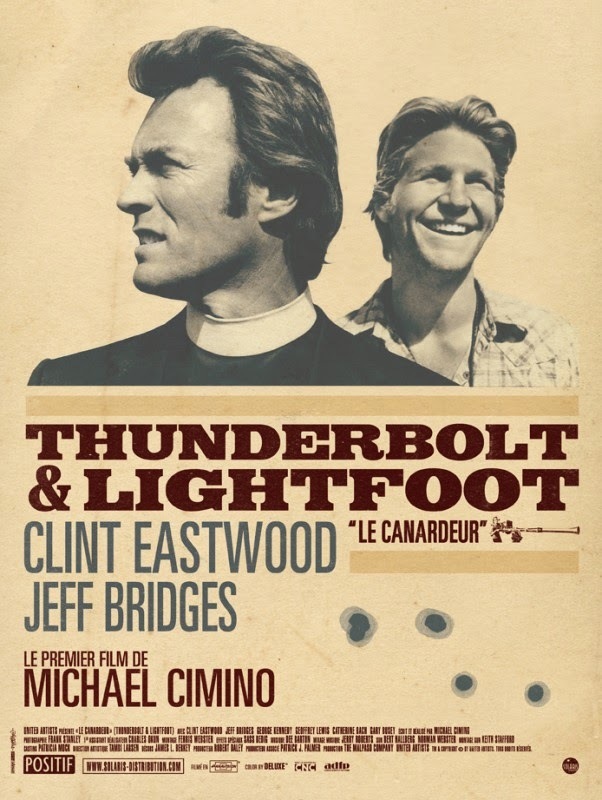 When two thugs suddenly burst into the church, shooting up the place in an attempt to kill Clint, it's clear within five minutes that THUNDERBOLT AND LIGHTFOOT is going to be an Eastwood action thriller like we are accustomed to, but also a little more offbeat, humorous and panoramic. 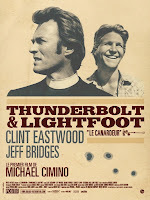 THUNDERBOLT AND LIGHTFOOT is the directorial debut of Michael Cimino, who went on to win an Oscar for directing the controversial THE DEER HUNTER (1978). He would later be blamed for bankrupting United Artists with the flop HEAVEN'S GATE (1980). The original idea for the picture came from Cimino's agent Stan Kamen at the William Morris Agency. Kamen suggested he write a script on spec with Eastwood in mind. Upon reading the script, Eastwood was sufficiently impressed to consider directing it himself, having been happy with Cimino's work on MAGNUM FORCE (1973) and very interested in making a road movie (EASY RIDER had been a huge success in 1969). Eventually, Eastwood decided to give Cimino the director's chair. it's clear Eastwood believed in Cimino's talent, but it's also highly probable that one factor was that he would be able to control him. Cimino later became famous for the number of takes he filmed, but according to Jeff Bridges, Cimino had to ask Eastwood for permission if he went over a few takes (but would alllow it if Bridges wanted to try something different), and according to first assistant director Charles Okun, Eastwood would refuse to go over four takes and wouldn't stand for long set-up times. (The year before, Ted Post and Eastwood had clashed over Eastwood calling the shots too much.) Warner Brothers considered the film too offbeat for Eastwood, and declined to finance the film. Eastwood (whose Malpaso Company would produce the film) took the film to United Artists instead. In the film, Eastwood flees his pursuers by accepting a lift from a happy go lucky, con-man drifter named Lightfoot (Jeff Bridges). The story now becomes a 'buddy' movie, in which the pair strike up an unlikely friendship. 'Thunderbolt' is an ex-Korean War veteran, about ten years older (in actuality nearly twenty! ), a professional and a loner. Lightfoot is charmingly cocky, carefree and energetic. 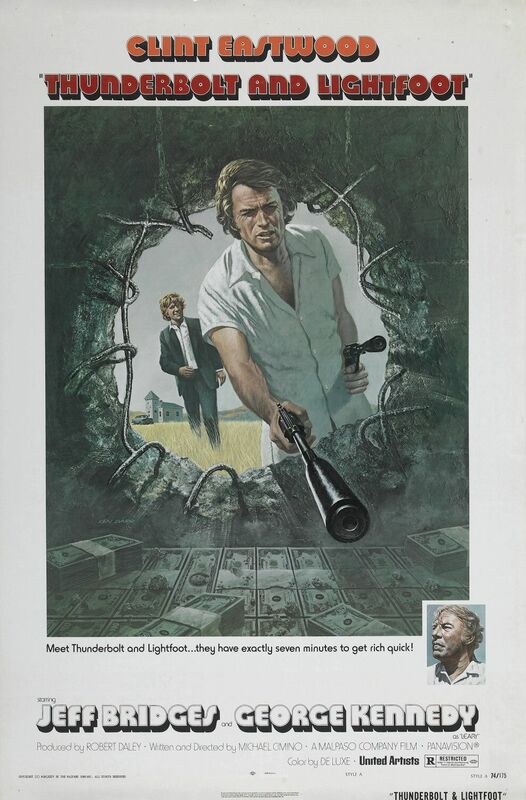 'Thunderbolt' is touched and amused by his insistence on them becoming friends, and eventually brings him along on his next caper, alongside two ex-colleagues (an angry George Kennedy and an hilarious Geoffrey Lewis) who mistakenly believe Eastwood betrayed him on a previous 'job' and stole the loot. Meanwhile, Thunderbolt and Lightfoot secretly plan to locate and grab the missing loot for themselves. 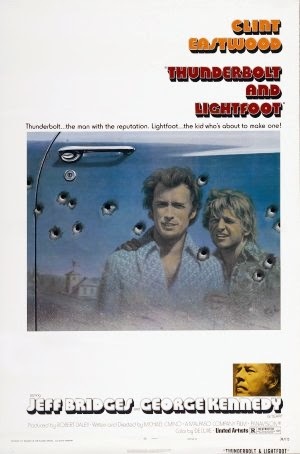 THUNDERBOLT AND LIGHTFOOT is an interesting film because it delivers the entertainment we expect from an Eastwood vehicle, but there's something off-kilter going on both in and under the text. In his first film, Cimino exhibits mastery of tone. The picture's humour alternates between light and breezy (particularly hilarious are Kennedy and Lewis's adventures in suburbia as they get 'real jobs') and oddball. The scene involving the leads getting a lift from a deranged hillbilly (Bill McKinney in his first of seven Eastwood appearances - he's the guy who raped Ned Beatty in 1972's DELIVERANCE) comes out of nowhere and is both hilarious and a little disturbing. The hillbilly has an impressive car that attracts the hitch-hiking leads, but it becomes quickly clear that all is not right with their driver: he keeps a caged raccoon on the passenger seat and is going mad from the leaking carbon monoxide fumes coming off the broken exhaust pipe (which he has broken on purpose). Eastwood and Bridges are trapped in the back seat. Once they manage to get out of the car, the guy opens his trunk to reveal numerous white rabbits. As they proceed to escape, he starts shooting at them, before being overpowered by the mighty fists of Eastwood. The scene is an important scene in the film not only because it's an entertaining highlight, but also because it's a brilliant example of how the film works on two levels. It works as a funny detour that could simply exhibit Cimino's odd sense of humour, but it also works subtextually. It's ambiguous enough to have many possible readings (certainly the dangers of 'the road' or America itself that lurk below the surface is a persuasive one), but it arguably is meant to foreshadow, and subliminally prepare us for, the devastating ending where Jeff Bridges is kicked to death by George Kennedy and has a slow death that Eastwood fails to notice until he slumps on the car seat. One reading of the film is that Bridges' character is the catalyst for change in the film. His relationships with Eastwood and George Kennedy are very different but they share one quality: they are both attracted to him. Eastwood and Kennedy's characters are both war veterans who have been damaged or disillusioned by their experiences. In one shot we see that Eastwood has been physically damaged by war: he is wearing a leg brace. In another scene Eastwood pops his shoulder out, making the film one of the first examples where he is allowed to appear vulnerable. (Interestingly, Eastwood also had a damaged leg in THE BEGUILED, 1971). By the end of the film, Eastwood's notions of the limits of male friendship have been proved wrong. He has achieved a close relationship with Bridges. Kennedy is a repressed man who cannot abide his sexual attraction to Bridges, and when Bridges jokingly kisses him on the mouth (literally giving him what he wants), Bridges fate is sealed. He will die for bringing out into the open what Kennedy (and society?) wants to be sealed forever. One could also see Bridges' death as representing the death of '60's idealism. The energy and positivity of Bridges has real worth, but at the end of the day, 'traditional' and 'straight' values will always prevail. Eastwood returns to the familiar world he lives in at the end of the film, but he has been forever been changed and his victory (reclaiming the loot he had stashed away from a previous robbery) now seems hollow. America was changed forever by the idealism of the '60's, but it couldn't and wouldn't be allowed to exist forever. Up until the aftermath of the heist (in which Bridges is required to dress in drag), the film has maintained a balance of humour and action, crossed with 'buddy' movie elements and the mountainous landscape of Montana being almost a character in the film, courtesy of Frank Stanley's fine widescreen camerawork. With the 'aftermath', the film unexpectedly (although we have had the subliminal foreshadowing) shifts gears to become a tragedy. George Kennedy kicks Bridges to death, and as the pair approach their victory and find the stashed loot in a one-room schoolhouse, we the audience (and not Eastwood) see that something is very wrong with Bridges' condition. It's unexpectedly heartbreaking, being twinned with the moment of victory. Bridges' performance here is almost certainly what won him the Best Supporting Actor nomination (the second of six nominations). It's brilliant. First you see him get bothered, next worried, then unnerved, and finally overcome by the paralysis creeping through his face and body. It's one of the most memorable and moving bits of acting in cinema. The scene also marks Cimino as a major director. We now realise that he has subverted our expectations of what an Eastwood pic, a buddy movie or a heist thriller should be. It doesn't feel like a trick or a betrayal because subliminally we have been prepared, and we now realise that Cimino was playing for keeps all along. The ending doesn't make us feel angry because it feels right: life is light and breezy, sometimes oddball, sometimes exciting, is defined by how close we get to people...but the spectre of death, of a reversal of fortune, of fate, of the consequences of our actions, of being 'free' in a 'straight' society is always present even if we are too preoccupied to pay notice to it. Eastwood was unhappy with the $9m domestic gross of the film (although it eventually recouped it's $4m budget over six times in the US alone) and blamed UA for weak promotion. He vowed he would 'never work for UA' again, and cancelled a two-film deal he had signed with the studio. Some have proffered that his anger was really due to the fact that he felt upstaged by Bridges and/ or he felt he should have been pushed for an Oscar nomination as well. Regardless of whether or not he should have been nominated (he should have been), his performance is both subtle (one can see a flicker of sorrow on his face when he drives off at the end with a dead Bridges beside him) and generous one (he allows Bridges to shine and never tries to upstage him, and with Kennedy and Lewis allowed their own space in the film, it's almost an ensemble piece anyway). He and Bridges have good chemistry), which makes the film work. They're a great match, the still, taciturn Eastwood and the ball of energy Bridges. One is really convinced that the actors really liked each other (which reading between the lines in interviews they almost certainly did). In fact, Eastwood has rarely been as relaxed, as self-deprecating and as human as in his scenes opposite Bridges. It's a shame they never collaborated again, and a double shame because the great majority of Eastwood's future co-stars never rose up to the challenge or had the chops to share the screen with him. Bridges is simply a great actor who until recently was The Most Under-Rated Actor Alive. He's one of the most likeable actors ever too, and despite having the showier role, he is quite a subtle actor himself. Lightfoot is a character who could easily become tiresome (he's always 'on'), but he makes the character so 'alive' and in tune with himself that he becomes the pulse and heart of the picture, making his death all the more powerful. For once, we actually wonder whether Eastwood will be able to cope with the loss of a loved one and maintain his loner mindset. 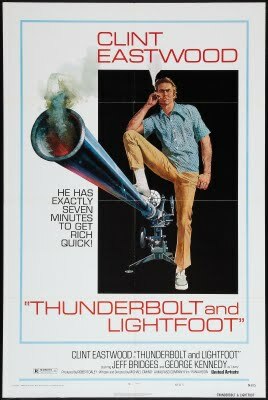 THUNDERBOLT AND LIGHTFOOT, despite it's cult status, deserves even more recognition. It's deceptively light and breezy tone and status as an Eastwood vehicle disguise the fact that there are more interesting things going on underneath if you're willing to look. It's also the most consistent, balanced and well paced film Cimino has ever directed, and deserves to be mentioned in the same breath as THE DEER HUNTER and HEAVEN'S GATE. It's so much more than just a minor work from a director who went on to bigger and better things. NB. It's interesting that Cimino was the only director given a break by Eastwood who ever had a successful film afterwards. Even Cimino's success is limited to THE DEER HUNTER. That said, HEAVEN'S GATE and YEAR OF THE DRAGON (1985) now have their admirers (including me). James Fargo, Buddy Van Horn and Richard Tuggle have all failed to capitalise on their time with Eastwood. AVAILABILITY: The film is available in the US on a limited edition Blu-ray from Twilight Time. It is also available on a barebones DVD, non-anamorphically enhanced. 'Clint: The Life and Legend' by Patrick McGilligan (Harper Collins, 1999.) A fascinating, revealing and depressing look at the dark side of Eastwood's life. 'Clint Eastwood in the 1970s': Wikipedia (entry for 'Thunderbolt and Lightfoot'). 'Sexual Politics in 'Thunderbolt and Lightfoot' by Peter Biskind, 'Jump Up no.4, 1974. 'Thunderbolt and Lightfoot' : Wikipedia entry (particularly useful).